i am, supposedly, a writer. able, allegedly, to call upon a, hopefully, vast vocabulary with which to describe virtually anything that i might see, hear, taste, smell, or, especially, feel in my effort to convey sensations and images to the reader. and yet i find that i just keep going back to the same four or five words to describe the beautiful, gorgeous, stunning, breathtaking, and awesome pin-ups that our pals have done for us for our upcoming trade. those words would be beautiful, gorgeous, stunning, breathtaking, and awesome. craig lassoed our pal andy kuhn into doing a pin-up for the second chances trade. here it is for you to dig on too...! so i met andy years ago at some convetnion or other and had recognized his name from work he had done at marvel and dc. but the stuff that i really love that andy's done are two creator-owned books that, when you look at 'em, seem almost like polar opposites. 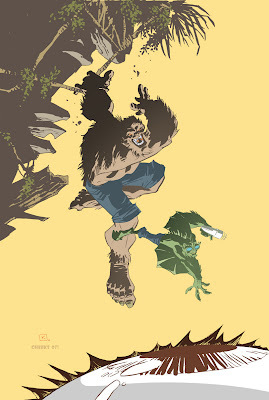 first, there's rex mantooth, kung fu gorilla. yeah, that's right. it sucked me in with the title. 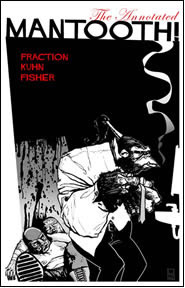 what a treat--the monkey is a super-spy, nazi-smashing, bond type and, while andy tells me that his original concept was for a kid-friendly saturday morning sort of book, when his writer/partner matt fraction joined the team, he just couldn't help himself. the book became a more adult romp, filled with some hilariously crude language and sexual innuendo all over the place. i loved this series, but also mourn the loss of the potential appeal it woulda had for kids. second is firebreather, the series from image comics that debuted as part of their new line of comics that included the blockbuster, invincible. 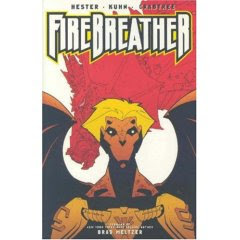 firebreather was the co-creation of andy and comics great, phil hester, and featured the tale of a teenager coming to terms with the fact that his long-absent father just happened to be a dragon. if you wanna have some fun, track down either one of these books, though, as i said, rex mantooth has it's adult-ier moments! both are filled with andy's great art and that's worth the price by itself! this pin-up, by the way, was colored by andy's--and our--pal cheeks! Somethings words do no justice. Like that pin-up. Very dynamic pin-up with a cool coloring job by Mr. Galloway. Looks like MG and Arisa got shut out of the pin-ups this time around. I heard about Rex Mantooth, but never saw it on the shelves. As for Firebreather, I really liked the art style Andy used on that one. 5 days till the NYC Con. Woo, Hoo. I was looking for some dude named "Zezago" who was mentioned in "Lying in the Gutters" this week... is this the right place? I don't know, but Zezago has a certain ring to it. "Ladies and Gentlemen, the Amazing Zezago!"